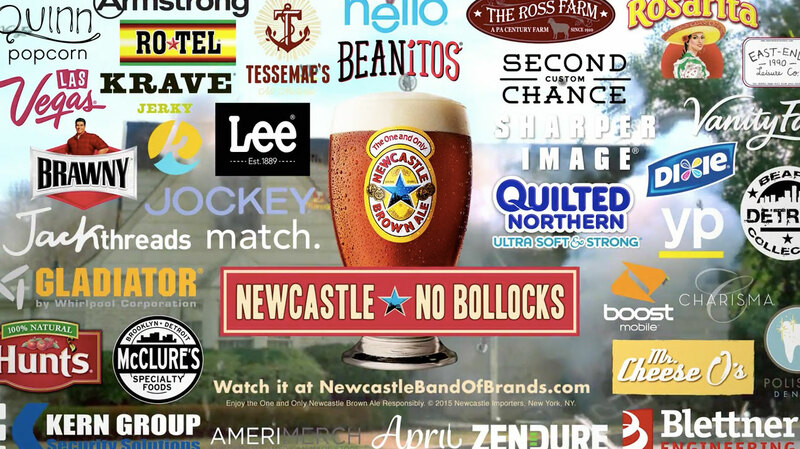 Newcastle just released its "Band of Brands" regional Super Bowl commercial, and it turns out Jockey, Boost Mobile, Lee Jeans, Brawny and Match.com are among the recognizable brands—along with some lesser-known ones—who are sharing the cost of the ad in exchange for a mention in it. Jockey is a particularly notable cameo, since, like Newcastle, it's a Droga5 client. If Jockey signing up was a favor to its agency, it was a worthwhile one—the briefs get a less-brief appearance (close-up product shot!) than many of the brands here. The creative approach is amusing, too, with a couple racing around their house, trying to make every brand's pitch in time—sometimes cutting each other off in mid-sentence, as the house gets cluttered and things get desperate. Unlike last year, when Newcastle punked the Super Bowl with the brilliant "If We Made It" campaign, the brewer is actually buying time in regional markets to air a version of this spot. "It's the most exciting, most jam-packed, most fiscally responsible Big Game ad ever," Newcastle says. "It's Newcastle's Band of Brands Big Game ad, featuring 37 of the universe's best brands … and a dental office in Pittsburgh."